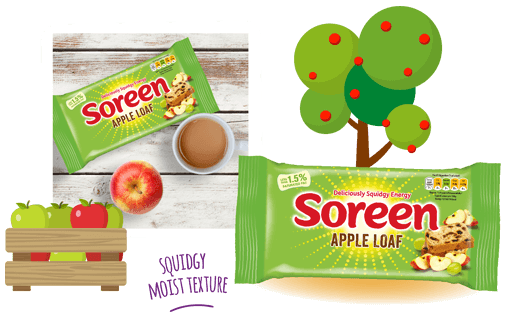 Busting with Apple flavour, this loaf is perfect for eating at home or wrapping up and enjoying out and about! 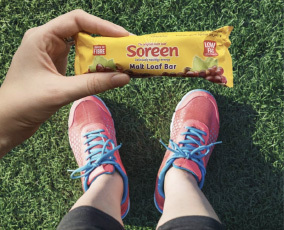 Fortified Wheat Flour (Wheat Flour, Calcium Carbonate, Iron, Niacin (B3), Thiamin (B1)), Water, Sultanas (12%), Glace Cherries (6.7%) (Cherry, Glucose Fructose Syrup, Sugar, Citric Acid, Colour: Erythrosine), Partially Inverted Sugar Syrup, (Partially Inverted Sugar Syrup, Colour: E150c), Currants (4%), Sugar, Vegetable Fat (Rapeseed, Palm), Sweetened Mixed Citrus Peel (2%) (Orange Peel, Lemon Peel, Glucose Fructose Syrup, Sugar, Acidity Regulator: Citric Acid), Malted Barley Flour, Wheat Gluten, Dried Whey (from Cows Milk), Salt, Mixed Spice, Yeast, Preservative: Calcium Propionate, Flavouring. For allergens including cereals containing gluten, see ingredients in bold. Produced in a factory which handles soya and oats. Although every care has been taken to remove fruit pips and stalks, some may remain. May contain cherry stones.